Nau mai haere mai! 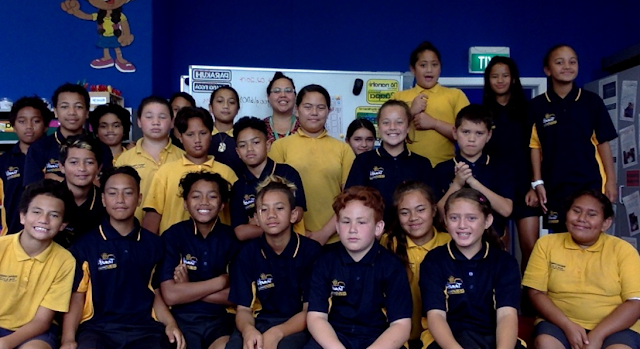 We are a class of Year 7 and 8 students in East Auckland and our kaiako is Miss Kyla! Nau mai hoki mai ki tēnei rangitaki o Ruma Tekau! Ko tēnei tō mātou haerenga i tēnei tau. Pānuitia, tirohia, ā, tuhia tō whakaaro e pā ana ki ā mātou mahi! Ko te kaupapa matua o tēnei wahanga o te tau, ko 'Te Taiao o Tāmaki.' Ko te tino tumanako, ka whāngai mātou te whenua o Papatūanuku, me te wai o Tangaroa. Ka mahi mātou hei kaitiaki o tō mātou taiao. Welcome back to the blog of Room 10! This is our journey this year. Read, view and write your thoughts and comments to our work! Our focus this term is Te Taiao o Tāmaki (The environment of Tāmaki). We hope to learn how to nurture our earth and waterways so that we can work as guardians of our environment. We look forward to sharing our journey with you! Kia ora Room 10. We are Room 7 at Glenbrae school and we are so excited to be one of your buddy classes for Te Taiao o Tamaki. Thank your visiting our blog already and we look forward to sharing our learning with you and also reading your blog posts. We are a class of Year 7s and 8s at Tāmaki Primary. We enjoy talking, art and basketball. Our topic this term is Ngā Mahi a Rehia (Hobbies). We look forward to finding out positive ways we can spend our free time. He tamariki mahana mātou, he tamariki katakata mātou, he tamariki pukumahi mātou! Find out more about what really goes on in our class, by visiting our Learning Site by clicking here. My actually last blog reflection of 2018 ! Current Event - Aggravated Robbery In Hamilton. Saia has been doing some learning about careers in the health sector. For his statistical investigation he researched the most common cause of death in 2016. Last week Room 10 students took over lessons across the school as tuakana for te wiki o te reo Māori. Mātakitaki mai!